My name is Tom Blancart, I was born in France in 1980. I grew up in the outskirts of the Alps near Grenoble, several hundred kilometers from the sea. 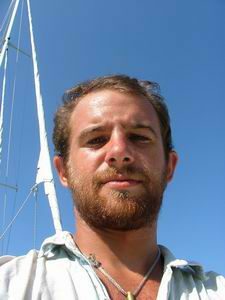 I did not grow up sailing and was completely unfamiliar with it until my early twenties. The first time I sailed was in 2002 but I have hardly spent any time ashore since. 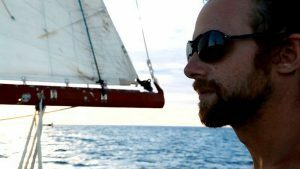 Over my first 3 years afloat before I started with Karaka, I crewed on several boats in North and Central America, Australia, the Western Pacific, South East Asia and the Indian Ocean. 15 years later, I’ve now sailed over 25 000 sea miles on boats other than Karaka, including two pacific crossings and several deliveries. In the 12 years since I left Hong Kong with Karaka in January 2005, I have completed a slow circumnavigation and covered about 65 000 nautical miles, for a personal total of over 90 000 miles. I am proficient with all aspects of seamanship and boat maintenance, even if I never went to pass the skipper test or even a boat permit and have no official certificate to claim the title of captain. I am able to fix and maintain about everything on a boat and sometimes do it as a side job. Before I turned to sailing, my short professional life was in the tourism industry. I followed two fields of study, one in engineering (physics, math, machinery, robotic, etc), applied to industry and that I never really put to use, and one in tourism as a tour guide. I’m a snow kid and I worked in Avoriaz, a French ski resort, a couple of seasons. From a very young age my parents took me and my siblings to travel all over the places, and at the tender age of 16 I was already volunteering as staff on adventure style trips in North African deserts. As a part of my studies, I went on apprenticeship in a safari company in South Africa, assisting the guides on tours in the reserves and parks. I went back the year after I ended school as a guide, for tours in South Africa, Lesotho, Swaziland and Mozambique. After I graduated from tourism school, I also started guiding ATV trips in Morocco, Tunisia and Libya, that my sister and I organized professionally. I left France in September 2001 among the turmoils of 9/11 and have been back only once since, in september 2012. I started by bumming around Canada and the States, driving car deliveries coast to coast a few times, before crossing to Mexico. 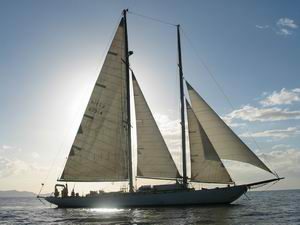 I then got the idea to start crewing on sailboats, and got lucky when I got a position in February 2002 on the schooner Ranger, 96ft, wood, built in 1914, a real classic beauty. 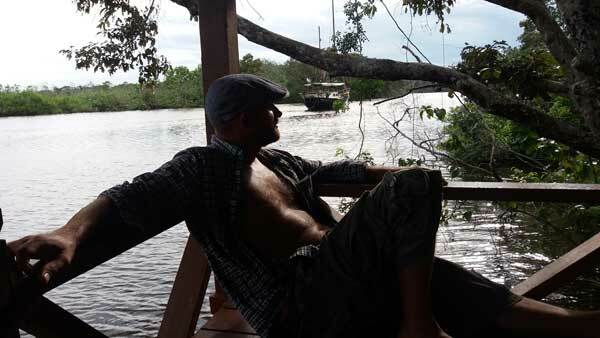 We sailed down the coast of Central America until we reached Costa Rica, where the owner ordered us to stay and try to earn money to maintain the boat. I helped doing charters as first mate for about 10 months, mostly beach barbecue day trips but also the occasional dive and surf. We featured in a UK surf movie, when we took 10 pros out on remote breaks. I could go on and on about stories that happened at this period but it is not the point here. When the captain left the boat in April 2003, I went back from another crew position in Florida to take over. We continued chartering a while before sailing slowly down to Panama for a major refit. I left Ranger there in July 2003 and crewed for various boats up and down the coast of Central America, before flying to Australia in December 2003. 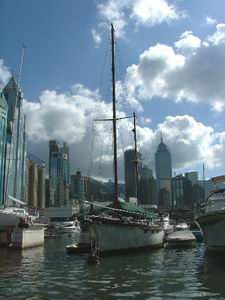 I sailed from Cairns on the Spray Replica “Willow” through Papua New Guinea, Micronesia and the Philippines before finding myself in Hong Kong, looking for a boat of my own, and stumbling on Karaka in June 2004. The reason I wanted a boat like Karaka is because after years of crewing for other people, I got tired to have to deal with captains, and not being able to do it my way, go where I wanted, at the pace I chose. I have never been rich and wasn’t really considering a 53ft ketch, but having the opportunity to save this ship from the scrape yard for a dollar, and doing most of the work myself or with friends, I managed to do it for relatively not much money. I don’t have any steady income but I manage to get by, mostly from odd jobs and “business “ventures such as chartering or “trading”. For the last 12 years my life has been Karaka, and I expect it will be for a while to come.